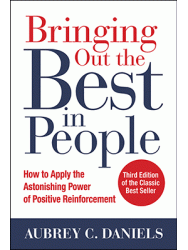 Learn how to apply the astonishing power of positive reinforcement. This 2-day working session introduces ADI’s proven behavioral technology, providing real-time human-performance tools, skill building in their application, and clear examples of how the technology has been applied in a variety of settings and situations. Most managers and supervisors face the same question, “How do I get people to give their best efforts in their jobs and to the organization?” Managing employee performance is the single most difficult thing to do when you don't understand behavior. Business is behavior; every action, every decision, every change is the result of what employees say and do. Bringing Out the Best in People is not a trainer certification course and is available to qualified individuals only. Training and consulting firms, independent consultants, external executive coaches, and other external organizational development service providers may not attend.